Padua: Villa with large private park. Property 4: Padua: Villa with large private park. Property 10: Manor House, view palladian monument. Ponte Vecchio. 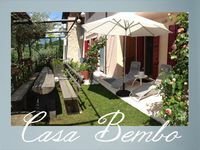 Property 15: Authentic holiday accommodation on a farm, near Asolo. Property 16: Authentic holiday accommodation on a farm, near Asolo. Property 24: Authentic holiday accommodation on a farm, near Asolo. This is a beautiful place, the grounds are clean and the apartment is spacious, clean, updated and perfect for large families. Roberts was a wonderful host, very helpful and accommodating. I highly recommend this place.